The inspection and evaluation of chimneys is an important service we offer. Chimney inspections come in many forms and you should be aware that not all inspections are alike. At American Chimney and Masonry, we follow the National Fire Protection Association (NFPA) recommended inspection procedures. NFPA divides the inspection procedure into three categories, or levels. The circumstances which give rise to the inspection determine what level of inspection we will conduct. A Level I inspection is the most basic level of inspection while Level II and Level III inspections are progressively more detailed and comprehensive. 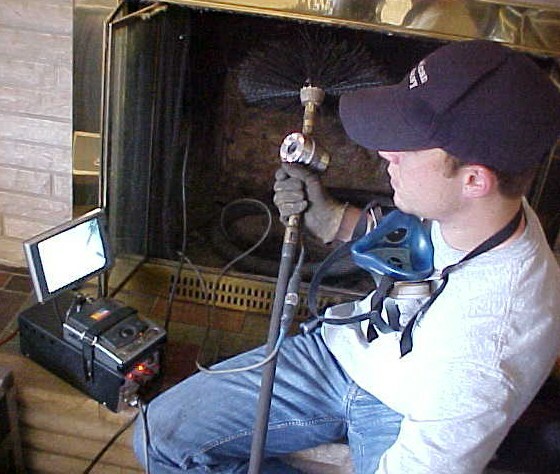 A Level I inspection is standard for each chimney cleaning or sweeping. A Level I inspection is limits readily accessible portions of the venting system, and accessible portions of the connected appliance(s) and the chimney connection. The inspector will check the readily accessible portions of the chimney, its enclosing structure, and the flue. A Level I inspection includes verification that the flue doesn’t have blockage or significantly restrictions. A Level III inspection is the most detailed of all of the inspection types and includes inspection of concealed areas of the building. However, examining hard to reach areas limits to areas we reasonably suspect of containing hazards that we cannot evaluate otherwise. A video scan is where we use a camera system which is lowered into the chimney (or pushed up from the bottom). The camera allows us to inspect the chimney from a range of just a few inches instead of just looking from the top or bottom. The camera image is viewed on a TV monitor by the inspector. Video inspections may be recommended if the customer or sweep suspects certain problems. Video inspections are often recommended after a chimney fire or some other form of damage to a chimney, and are a routine part of a Level II or Level III inspection. In conclusion, you should be aware that even the most thorough inspection will not reveal all problems. Some areas of a chimney simply are not assessable due to construction of the house. Be sure to discuss any specific concerns with your service technician. The recommended inspection technique will often be based on your comments and concerns. Finally, our technicians are trained to perform the appropriate level of inspection based upon the use of the chimney and any performance problems or safety concerns using the NFPA 211 as our standard.